1. Prepare garlic; let stand 10 minutes. 2. Steam carrots, covered, 10 minutes or until tender. 3. Heat butter in large nonstick skillet over medium heat. Add garlic and ginger to pan; cook 1 minute, stirring constantly. 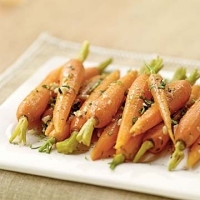 Remove from heat; stir in carrots, cilantro, and remaining ingredients.